The life of a believer cannot be imagined without the mosque institution which as a community center should always occupy as much as possible the central and most strategic locations in villages, neighborhoods, towns and cities. The mosque should always contain as many meaningful and useful components and facilities as possible so as to function as a vibrant and effective community center. Good mosques are accessible, pleasant and convivial. They are cost-effective, environment friendly and sustainable. They provide a wide range of activities, benefits and services to their users so that they become resourceful, relevant, lively, valuable and alluring to both men and women, the young and old, the rich and poor, the busy and idle, and to the exemplary and average Muslims. Mosques are to be their people’s assets, not liabilities. Not just physically is a believer attached to the mosque, but also spiritually and mentally in his thoughts and cravings. Indeed, a true believer’s heart always yearns for the mosque. 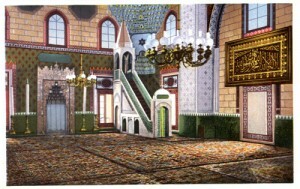 He feels most tranquil and contented inside the mosque. When he leaves it, his heart is attached to it until he returns to it. Mosques are the houses of Allah (buyut Allah). They are Islam manifested. They thus must be perceived, created and utilized only as such. Those and other similar truths are to be remembered and painstakingly observed during the processes of planning, designing and building mosques. Mosques are to be living realities; to be living Islam. They cannot afford to become an elitist concept. They cannot afford to become mere landmarks, touristic attractions, the false symbols of a false power, and virtually dead monuments. Mosque architecture, first and foremost, should remain associated with the multidimensional world of functionality. It must not deviate from its authentic character and stray into the world of excessive invention and abstraction. Mosque architecture must not become a plaything in the hands of some misguided benefactors, architects or artists. If truth be told, when Muslims lose their spiritual and emotional connection to their mosques, virtually all authentic mosque art and architecture then end. The mosque is a microcosm of Islam and every true believer’s being. Today as part of a holistic Islamization scheme, reviving the idea of the mosque as a community centre is crucial. The concept of the mosque complex functioning as a central focus of Muslims’ lives, in both physical and spiritual terms, ought to feature notably in the educational contents of Muslims at all levels. Not to be just a target, however, the mosque is to play an active and leading role in galvanizing such an educational outlook too. It is to be turned into a dynamic and visionary educational centre itself. The mosque has to function as a community centre, as it was always meant to be, subject to the extent of the people’s needs and capacities. As many as possible of the numerous religious, social, educational and welfare roles and functions should be placed under the jurisdiction of the mosque and its annexes. Many other functions and roles will inevitably be shared by other social institutions, some more and others less. Along with those other social institutions and establishments, the mosque is thus to lead the way in transforming and revitalizing Muslim societies. The mosque will spearhead an institutional coalition representing all the segments and strata of society. It follows that neither the mosque institution on its own, nor the other social institutions in isolation from the mosque, are capable of reviving the fortunes of Muslims and the Islamic society. The mosque and other institutions must work together towards the common good of Muslims. They are not to adopt and promote an ideological or conceptual dichotomy among themselves. They are to share almost the same philosophy, vision and mission, whereas their respective delivery systems and operational strategies will have to vary. They are not to be at odds with each other, one trying to undermine or destroy the other. They are not to conspire against, and try to outshine, each other either. Surely, this same relationship pattern must be adopted and followed by the two most influential parties in society: the scholars (ulama’) and the rulers (hukkam), who, essentially, are in charge of virtually all the institutions, bodies and establishments in society. Anything but that scenario will spell weakness and disaster for all. In addition, mosques must be empowered to become the detectors and annihilators of all religious and cultural deviational beliefs, traditions and innovations. The whole society, driven and guided by the power and charisma of the mosque institution, must resolutely confront those tendencies and their protagonists which show signs of being inclined to instituting, practicing and promoting such repulsive beliefs and customs. Everything in the Islamic society, be it within the ambit of the mosque or beyond, is subjected to the mosque’s authority – i.e., to the authority that it typifies, which is the authority of Islam. From the mosque, they all originate, one way or another, and to it they return for the validation and endorsement of their identities, ethos and practices. Surely, the God of the mosque is the God of everything else. Muslims cannot worship Allah in the mosque, but outside it they worship or glorify some other gods, deities or idols. Similarly, Muslims cannot propagate and hold supreme the worldview, principles and values of Islam in the mosque, but outside it they advocate and hold supreme other sets of worldviews, principles and values. Muslims cannot be believers and servants of Allah in their mosques, but outside them they are, for example, secularists in politics, materialists and self-aggrandizers in commerce, hedonists in leisure and entertainment, fraudsters and fibbers in mass media, extreme careerism seekers in education, and individualists and narcissists at home. In Islam, life in its totality is to be seen as worship and the whole earth as a mosque. In all his terrestrial pursuits a Muslim is to view his self as no more than a servant of his Creator and Lord, Allah. If the mosque does not function as a community center, and worse yet, if the mosque institution is entangled in an institutional ideological confrontation with other institutions, the power and will of the people at the end will become diminished and their focus diffused. Life struggles will lose their transcendental ontological sense and meaning, becoming sheer mundane and inconsequential routines. The people, especially children and the young, will get perplexed as to which ideological preference to subscribe to and support: that of the mosque or that (those) of the other institutions. As a likely, yet impossible and futile, course of action, many persons will try to merge the elements of the existing ideological dichotomy or conflict between the mosque institution (Islam) and the other ideologies and worldviews. Dangerous as it is, however, such a feat will only increase the people in spiritual and mental confusion and disturbance, which, in turn, may lead to some serious doubting, anxiety and outright denial and rejection, as the truth and falsehood, and the light and darkness, cannot be reconciled or merged. 1 Muslim, Sahih Muslim, Book 032, Hadith No. 6258. 2 Al-Bukhari, Sahih al-Bukhari, Vol. 3, Book 43, Hadith No. 626. Next Should Non-Muslims be Allowed to Enter Mosques?